This article tries to identify the need-gap factors that drive the market for solar devices in India and subsequently develop a marketing strategy to launch solar panels and arrays under the umbrella brand name, Neo-N into the Indian market. As per our study, proper business models and proper positioning of the products, so as to cure technological and monetary disillusionments in the minds of consumers, is missing in the Indian market. Hence, the key to success for a new player in this space is to offer customized products and services for different consumer segments. As per some recent reports, India needs to double its current power generation capacity by 2020. Just to highlight the potential in numbers, 80,000 villages in India are still un-electrified. Contribution from existing resources is unlikely to be sufficient in future and hence, shift towards renewable energy is imperative. Given the sunshine hours per day in India, tapping it at even a conversion efficiency of 10% can generate enough power to meet the requirements in 2015. However, solar energy based solutions will not find wide acceptance in the market if they are not tailored to meet the varied demands of the end consumer. The objective of our study is to develop a comprehensive marketing plan for a new brand of solar panel and arrays, called Neo-N. We first try to understand the demand characteristics in the market for solar devices by surveying the consumers. Then, we try to identify the gaps in the products and services offered by current players in the market. Using these set of information, we arrive at market segmentation and propose customized offerings for each segment. In this study we have also explored new sales channels over and above the conventional B2C channel to reach the end consumers. LOHAS consumers are usually the first users of energy-efficient, durable, healthy products and can be the best for "word of mouth" publicity. Hence, they make the perfect targets for Neo-N.
Online survey and interviews of professionals, working individuals, house-wives, hotel/lodge owners, builders etc led to revealing insights into the customer attitudes towards solar investments. The requirements varied from a reliable power back-up for few hours during load-shedding in houses for working couples to full-fledged solar heating systems leading to cost reduction in monthly bills in lodges. Individuals and small set-ups were more bothered about the one-time investments, space constraints, regular maintenance and non-availability of good service, complexity in the panels and the missing "do-it-yourself" feature. Builders and hotel owners were more bothered about the break even periods, ongoing maintenance costs, replacement and capacity-addition costs, aesthetics, architecture's inclinations and government's incentives for green buildings. Also, the individuals/households were found to be motivated to buy this product on an emotional appeal (towards energy conservation) and short term benefits, hotel owners look for long term tangible benefits in cost reduction and builders/construction houses for aesthetics, long term utility and government incentives. We recognize the Innovators or the early adopters for Neo-N as the LOHAS consumers. Innovators and early adopters are people who are technologically savvy and are early users of any technological innovation over its product life cycle. LOHAS stands for Lifestyle of Health and Sustainability. These are educated, working, young professionals, who are socially responsible and show increased alignment of principles with such values. These people are usually the first users of energy-efficient, durable, healthy products and can be the best for "word of mouth" publicity. Hence, they make the perfect targets for Neo-N.
Current products in the market have not been able to create an identity and are being sold as commodities rather than as technologically advanced products. None of the current players claim low costs. However, they all claim significant value creation, savings and long term benefits. They distinctively communicate the benefits for separate segments explicitly, even though the benefits might appear conflicting in nature, or would attain different relative importance depending on the segment targeted. For example, environmental concerns achieve higher importance than efficiency in case of government offerings, while the reverse happens for corporate clients. The segmentation varies from the typical corporate hubs, homes, shops, roads and such infrastructure installations, isolated farm houses, regular trekkers, yacht owners etc. The promotional techniques that they use include extensive use of testimonials, pictures of successful prominent installations, toll free services, solar calculators to show tangible savings, webinar invitations, environmental clubs and related activities. Thus we see extensive micro-segmentation, use of influencers and the push-pull strategy for promotion by these players. What's missing in the market today? We strongly recommend a service-centric business model for marketing solar panels and solar arrays in the Indian market along with creation of brand identity and offering life-long cost savings. The present competition is very low but many new players are entering. Most of the existing players are solar cell manufacturers and there are very few who manufacture solar panels for households. The existing players have been unable to create brand identity for their products. In effect these products are rather being sold as commodities rather than as technologically advanced products. The value proposition that most of the existing players offer is hedging against power cuts. However, our primary research shows that value proposition of not merely hedging against power cuts but as an electricity-cost saving device and as substitute for conventional electricity will be more effective. There is clear dissatisfaction among consumers with the after-sales service. Based on these findings, we strongly recommend a service-centric business model for marketing solar panels and solar arrays in the Indian market along with creation of brand identity and offering life-long cost savings. Radiance series: This product variant for households segment is the basic model. It will have a one year warranty, guarantee assistance during installation and will come with a green packaging to convey eco-friendliness. Challenger series: This is meant for medium-scale applications. The product features will include 3 sizes to suit the capacity, superior efficiency, chassis and panel colours that would match the ambience, 3 year warranty and better after-sales service. Innovator series: This variant is meant for large scale capacity requirements. It will be modular in nature to enable capacity additions in stages as needed and can be customized to suit the location of installation, the aesthetics as well as space constraints. It will come with a 5 year warranty and after-sales service components like free periodic checks, free replacements for minor component defects etc. 1-3 years: Focus on short and medium term benefits, emotional appeal to LOHAS customers, solution for load shedding and small power requirements. 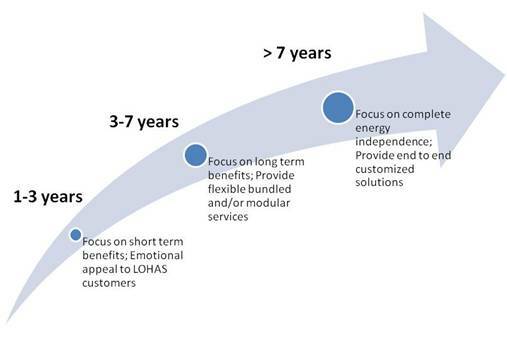 3-7 years: Focus on long term benefits, government incentives, net-metering, projecting the accrued savings and shorter break-even periods, providing flexible bundled and/or modular devices. >7 years: Focus on complete energy independence, stand-alone, end-to-end customized applications, environmental benefits, longevity. The time line for promotional campaigns is summarized in Exhibit 1. We propose using additional channels over and above the conventional B2C model in order to increase penetration as well as expedite the process of reach to as many consumers in a short time. Also, different models have different financial benefits. The following are two innovative business models that can be used for creating brand identity and garnering large contracts for ensuring steady stream of cash inflows. PPAs are targeted towards exploiting the advantages of economies of scale. This business model works very profitably in situations where the government incentives and rebates in the use of solar energy are very high. Under this model, the consumers and Neo-N would enter into a long term contract. As per the contract, Neo-N would bear all the costs of installation and maintenance of solar systems on the roof-tops of the client's set-up over the tenure of the contract. The client pays a very minimal amount up-front, around 20-30% of the total Neo-N investment and leases it's roof-top to Neo-N. Along with this, client needs to promise that it would purchase all its electricity required from Neo-N only, over the contract tenure. Neo-N secures the financing for its operations through the investments made by corporate and huge companies, who wish to earn the benefits of government incentives and tax rebates on their "green investments" as well as to earn carbon credits. It will prove more profitable for them as the market for carbon credit develops further in India. Maintenance and repairs are all managed by Neo-N. Hence a hassle-free proposition. Neo-N enters into a contract with the Municipal authorities of cities and proposes to invest in powering all the street lights on solar energy and installing solar panels on each of them. The SEBs who control these street lights need to allow Neo-N to access its central control, where-in Neo-N installs its equipments and a special software database, that controls the switching of these lights as per conditions of the day, like sunlight, traffic on roads etc. The central database needs to be regularly updated to improve the learning curve, and thus reduce wastage. Savings accrued in electricity bills are retained by Neo-N. Thus Neo-N invests money and earns on the savings it manages to accrue. The government bodies have no substantial role to play in the entire scheme thus removing any possible regulatory or operational hassles that Neo-N could have otherwise faced. In order to meet the rapidly growing electricity requirements in coming years, India will have to turn towards renewable sources. India's geographic location makes solar energy a very attractive candidate to meet the energy needs. However, one solution fits all approach is not going to work in a market where consumer requirements are varied. Current products and services in the market for solar devices do not meet the expectations of many consumer segments and problems like poor after sales service plague the industry. Neo-N, a new brand of solar panels offering the right value proposition can step in to fill the existing gaps in the market. In our comprehensive marketing plan, we have identified major segments to be targeted and have proposed developing customized solutions for each segment in our study. Exploring additional sales channels for additional revenues stream and to increase penetration can be taken up as an extension to the marketing plan developed here.